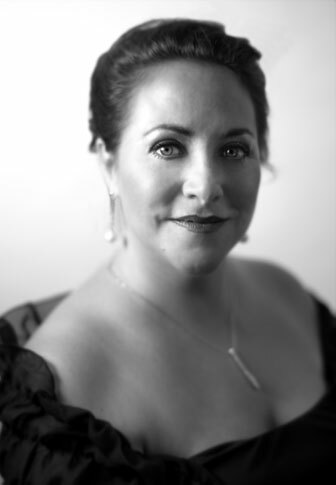 Soprano Lori Phillips was last at Seattle Opera in 2007, when she covered the role of Senta in The Flying Dutchman, and we're excited to have her back--this time to star as our opening night Turandot. (Phillips will sing every performance except for the Sunday matinees on August 5 and 12, when the role will feature former Seattle Opera Young Artist Marcy Stonikas). We recently sat down with Phillips to chat about Turandot, a character she feels is often inaccurately portrayed as a "cardboard cutout." We asked Phillips about the nuances she tries to bring out in Turandot and also learned more about her family background and her passion for baseball. Welcome! It’s nice to have you back in Seattle. Can you remind us of some of your previous experiences at Seattle Opera? Well, last time I was here was for The Flying Dutchman in 2007, where I was actually standing by and covering for Jane Eaglen. That was a wonderful experience, and I sang an orchestra rehearsal on stage. Before that, I had done Un ballo in maschera in 2002, which was a great production; the orchestra here is so fabulous, and the conductors Seattle hires are always wonderful. The quality is so high here, and everyone also makes you feel so at home. My first time here was for the Ring in 2001, and I was pregnant with my son that summer. Everybody was super nice and so considerate and concerned. I was singing Gerhilde, one of the Valkyries, and I had to climb to the top of the set, basically, and wave. So they gave me a harness to protect me and make sure I was comfortable, because I was with child. Your twin sister, Mary Phillips, is no stranger to Seattle Opera, either. Yes, she was here a couple years ago for Il trovatore. Have you two had many opportunities to perform together? It happens fairly often. We certainly have plenty of time when we’re on our separate jobs, but we had our first production together in 1999, when I sang Fiordiligi and she sang Dorabella in Così fan tutte. We sang together here in Seattle, too, in the 2001 Ring. She was one of the Valkyries, as well. Then we did Die Walküre in Dallas together, and then in Hawaii in 2010. We were also just there for Aida, actually. We’re always running into each other at the Met, too. Lori Phillips as Amelia in Seattle Opera’s 2002 Ballo in maschera. 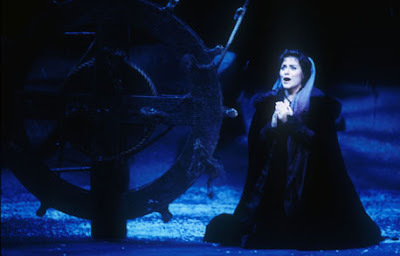 Did you both develop your passions for opera at the same time, or did it happen independently of each other? Actually, I developed it first. Mary was more interested in straight theater (and also music). We were both instrumentalists throughout junior high school, high school, and college, and I was the one who majored in music first. I think she was trying to be practical; we had a little pressure from our parents not to do something so crazy as go into music. So Mary actually started out as a chemistry major in college, but we always did musicals together in community theater and things like that. We were basically together, but I suppose I was the one who definitely set on to pursue this as a career first. Obviously, it worked out for the both of you—so your parents must have been pleased! Oh, yes. Our parents, oh my gosh, they have just been so thrilled—and shocked. Not that they ever doubted we had talent, but my mother was a secretary, my father was a machinist, and we’re from a blue collar background. Nobody ever did this as a profession before. My father, who passed away a few years ago, had a natural talent. He had a booming voice that usually came out when he was yelling at us. [Laughs] I also have three brothers, so there were five kids in the house, and there was a lot of disciplining that needed to happen! But he also sang when he was a younger man, and had this baritone voice that people noticed. He was actually encouraged to move to New York when he was young to pursue a singing career, but he never did. He couldn't imagine you could actually make a living doing that. You’ve sung Turandot many times over the years. How has your approach toward her changed since the first time you sang the role? I think she’s become more human for me over the years. 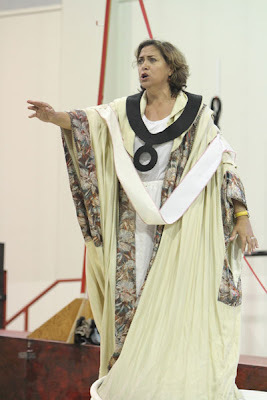 When I first sang Turandot, it was a co-production with Opera Memphis and Nashville Opera, and the director there was a wonderful man named John Hoomes and we were always talking about Turandot’s psychological background. It’s so interesting to do that with all operatic characters; they’re really so multi-dimensional. For Turandot to, usually, be played as this one-dimensional ice princess is unfortunate. When I’m playing a part, I always want to make it personal. I want to make it something that I can relate to and that an audience is going to relate to. I want to bring out her humanity, rather than play Turandot as a cardboard cutout of this one-dimensional wench who just likes to see men die and makes Liù kill herself. Lori Phillips in rehearsal for Turandot. Yes, the audience does tend to sympathize with Liù more than Turandot! I’ve talked with a few Turandots who wanted to stop doing the role because they felt underappreciated at the end of the night. It is a very difficult role to sing, so you want to be appreciated. But I haven’t had that feeling. What would you say motivates Turandot? What is she looking for? Well, the thing that she’s looking for is true love. She wants to be validated through love, like most of us. I was just talking with my Calaf, Antonello Palombi, at lunch and he doesn’t think it’s about true love. Maybe for Calaf, it’s not. Maybe he just wants to overcome and get power. That’s his choice, I suppose. For me, as Turandot, I want to find true love, and redemption, forgiveness, and salvation through this love. How does your desire to bring a warmth to Turandot affect your vocal technique? I’ve been told my voice has a warm, dark quality to it—but it’s hard to know what your own voice really sounds like. After the first music rehearsal, Speight Jenkins said to me that he wanted somebody who could sing Turandot with a warm quality all the way through and not a screechy, screaming quality. I sang the role for the first time in 2001, and over the years I’ve had to keep tabs on the technical aspects of it so I can keep that warmth and not get into a space where I’m screaming it out. The biggest thing is keeping the breath lower in the body, and using all of the sounding chambers that I can. I need to keep those open, and I think that’s, vocally, one of the hardest things in a role like this. Our sinuses, face, and chest should remain open and vibrant so the sound can resonate, but sometimes if your character has to be closed off in that “Leave me alone, don’t touch me” kind of way, it can hinder your sound. I’ve had to watch that. Moving away from the opera stage, you sang the national anthem at last Saturday’s Mariners game! Are you a big baseball fan? Yes, I am, and my family is. I have a little boy, Luke, who is 10 years old and loves baseball. I’m constantly being quizzed on baseball trivia. Well, my son’s team is the New York Yankees. My son and my husband and my stepson are going to get to go to the Yankees game on the 23rd. I won’t be able to go, but Speight was so great and got them tickets. I’m from New England, originally, so I’m actually a Red Sox fan, actually. But I’ve done the proper motherly thing and have stepped aside a little on that. I try not to get too crazy for the Red Sox anymore. That’s incredibly big of you! Thank you. [Laughs] I allowed my son to be a Yankee fan, because he was born in New York City. So where you’re born, I figure that’s where you have your allegiances. My husband is from Cleveland, so he’s technically an Indians fan. That’s great that your family gets to join you in Seattle! Yes, we travel together. My husband is basically a stay-at-home dad, and he teaches our son. We home-school our son so that we can travel together and be together for those long periods. (Usually an opera job is at least a month or five weeks). I’ve been lucky.